"Twenty years ago, Dennis Danson was arrested and imprisoned for the brutal murder of a young girl. Now he’s the subject of a true-crime documentary that’s whipping up a frenzy online to uncover the truth and free a man who has been wrongly convicted. But how do you confront your husband when you don’t want to know the truth?" 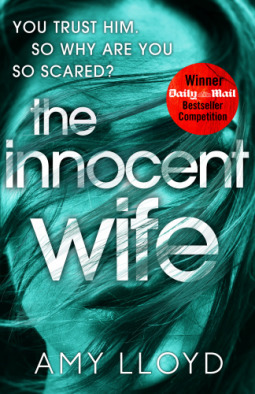 The Innocent Wife was a compelling read but one that I'm not completely sure how I feel about after finishing. When I first heard about this book I just couldn't resist the sound of that premise. I was instantly intrigued and wanted to read it. Honestly I just fell into the pages of this one from the very beginning. There is this feeling from the very beginning of uncertainty that really doesn't let up until the very last page. It's hard to explain but that's the best way I can think to describe it. For instance, there feels like there is something slightly "off" with Samantha although I didn't know quite what it was. Or if I was even right in feeling that way. Then Samantha and Dennis's relationship begins and that too doesn't feel right. The entire book was like that for me and it just add this layer of tension and atmosphere that I couldn't get enough of. I read this book quite literally questioning every character's motivations and actions because I just couldn't trust any of them. They actually all almost had a layer of ick to them if that even makes sense. The only character I really liked was Carrie (a secondary character that was doing the documentary on Dennis). So the author has build this crazy intense vibe where you almost expect anything to happen and then the ending hit. Stop reading here if you don't want any spoilers (I'll keep them at a minimum but still). I just could not get behind the ending of this book. It felt rushed and unexplained in a way that didn't seem to fit with the rest of the story. And I don't honestly know if it was just me - maybe I was just so unprepared for the way it ended that it caused it not to work for me? I don't know? I haven't yet read any other reader's thoughts yet because I wanted to write up my thoughts first but I am very curious. Don't get me wrong as it wrapped things up but just in a way that seemed so much less than the first 3/4ths of the book. I really don't even know how to explain it other than that. As always take my thoughts with a grain of salt because really otherwise I found this book to be a very good read. Overall, I enjoyed this one but didn't love it for the reasons I stated above. 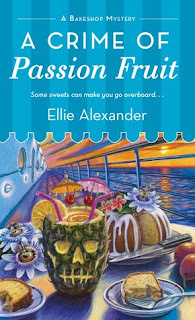 I will certainly read more by this author and am actually really looking forward to whatever she comes up with next. I just couldn't not mention the ending when I was still questioning and thinking about it two days later. I feel like this is a book that would be really great to be discussed with other readers. I'm looking forward to doing just that if I'm being honest so if you've read this book leave me a comment so we can discuss! I was trying to decide how I would rate this book and I still think that I would give it four stars overall. The ending threw me a bit but the rest of it was just so good! I would recommend this book to readers of suspense and thrillers. 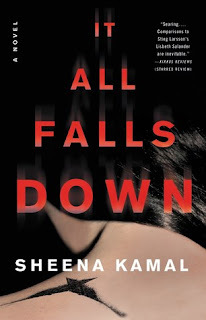 Bottom Line: A compelling and suspenseful read that left me wanting a bit at the end. Disclosure: I received a copy of this book thanks to the publisher and NetGalley. Thoughts are my own. "Gillie Trewlove knows what a stranger's kindness can mean, having been abandoned on a doorstep as a baby and raised by the woman who found her there. So, when suddenly faced with a soul in need at her door—or the alleyway by her tavern—Gillie doesn't hesitate. But he's no infant. He's a grievously injured, distractingly handsome gentleman who doesn't belong in Whitechapel, much less recuperating in Gillie's bed. Being left at the altar is humiliating; being rescued from thugs by a woman—albeit a brave and beautiful one—is the pièce de résistance to the Duke of Thornley's extraordinarily bad day. After nursing him back from the brink, Gillie agrees to help him comb London's darker corners for his wayward bride. But every moment together is edged with desire and has Thorne rethinking his choice of wife. Yet Gillie knows the aristocracy would never accept a duchess born in sin. Thorne, however, is determined to prove to her that no obstacle is insurmountable when a duke loves a woman." I found this book to be a delightful read and the perfect change of pace from all of the mysteries and thrillers I've been reading lately. This was also the perfect reminder of how much I enjoy historical romances and how I don't read nearly enough of them! From the very beginning I found myself swept away between the pages of this book watching the relationship between Gillie and Thorne develop. It was made even better because it felt so unattainable as if there was no way possible for them to be together. I'm a sucker for this type of romance trope and especially when it is done well. The author didn't just magically fix things for them or just gloss over it either. They had to really choose what they wanted and fight for their happiness. I loved every minute of it! I really adored Gillie though! She just made this book that much better for me. She is everything that you don't usually get with a romance heroine: she was strong willed, independent, and unapologetic in her viewpoints. She also didn't have the physical attributes that were necessarily considered desirable during that time period - she was tall, kept her hair cut short, and dressed in a way that didn't emphasize the fact that she was a woman. I loved her! There was just something so compelling about her character and I was instantly rooting for her happy ever after with Thorne. I really just couldn't get enough of this book and these characters so that should tell you all you need to know! Overall, I enjoyed my time with this book immensely! I'm so excited that I have book one in this "series" to look forward to while I wait for the next book to release. I adored all of Gillie's brothers so I can't wait for each of them to hopefully get their own books! Happily enough, I believe that this author also has an extensive backlist that I can look forward to as well! I really need more books like this in my life! It was just such a comforting read and one that I enjoyed every minute of. I can easily recommend this book to fans of romance but especially historical romance fans. You don't need to have read the first book to still enjoy this one (I didn't and I loved this one still). Highly recommended! Bottom Line: An immensely enjoyable read! Disclosure: I received a copy of this book thanks to the publisher. Thoughts are my own. "After getting a note demanding his presence, Federal Agent Aaron Falk arrives in his hometown for the first time in decades to attend the funeral of his best friend, Luke. Twenty years ago when Falk was accused of murder, Luke was his alibi. Falk and his father fled under a cloud of suspicion, saved from prosecution only because of Luke’s steadfast claim that the boys had been together at the time of the crime. But now more than one person knows they didn’t tell the truth back then, and Luke is dead. 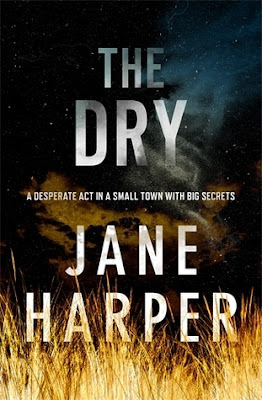 The Dry was one of those highly anticipated books that I just was waiting to read but then put off reading due to all of the hype. I really hate when I let that happen because I feel like this was such a great read and one that I should have read sooner. It was definitely worth the wait though and such an atmospheric read. I found myself just immersed within the pages almost instantly. The author was able to just bring the drought this small town was living through to life in such a way that it almost felt like a character itself. The devastation that the drought had caused and how it had created this underlying tension amongst everyone living in the town just felt so real and awful at the same time. It was almost like you couldn't fully blame people for their actions but instead it was all blamed instead on the drought. I really just could not get enough of this book and the mystery that lay within. I liked that Falk wasn't your typical detective hero. In actuality he had secrets himself from long ago when he lived there, and it was possible that those secrets had been behind the death of his friend. There were just so many questions and it kept me reading unable to put the book down. The mystery itself was well done and wasn't something that I saw coming. I was flying through the pages by the end just so I could see how it was all going to end. This is one of those books that I can easily recommend as I just enjoyed it so much! It was a memorable read and left me really excited to read more by this author. The one good thing about waiting so long to read this book is that I already have the second book just waiting to be read. I'm pumped to pick that one up after loving this book so much! It was a really good read and I just feel like the author brought the book to life for me. I can't say enough good things so I will probably just leave you with this: read it!! 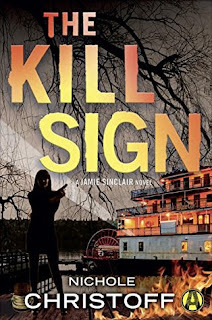 Highly recommended to both fans of mysteries and thrillers. Bottom Line: An atmospheric mystery that I just couldn't get enough of! Disclosure: I received a copy of this book thanks to the publisher and NetGalley. Thoughts are my own! 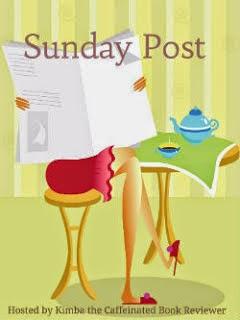 "The Sunday Post is a weekly meme hosted here @ Caffeinated Book Reviewer. It’s a chance to share news~ A post to recap the past week on your blog, showcase books and things we have received. Share news about what is coming up on our blog for the week ahead. See rules here: Sunday Post Meme"
Happy Sunday everyone! There went another month almost on the blog without a single post. The struggle is real sometimes folks. I've resigned myself to the fact that I just may never find the time to blog regularly but I will post as much as I can when I can. So lot's new over here to catch you all up on. School started which means I officially have a sophomore, a 5th grader, and a 3rd grader. School has started off well for all of them for which I am very thankful for. This week begins our crazy schedules/sports seasons once again. My oldest has football practice every day of the week and then games on Fridays. My youngest also starts up flag football this week along with practicing for his travel baseball team. And my daughter's travel softball team starts back to practicing this week as well. Lots of practices hopefully will equal extra reading time for me though so that's a benefit! We bumped up at work on our business required overtime hours as well this month so I'm fitting that in everywhere and anyway that I can. I'm blessed though as I have a wonderful family that pitches in when needed - we will be all hands in until fall sports are done. Reading wise I've been doing pretty much the same since I last posted. I'm averaging a book a week which isn't horrible or spectacular either. I would like to be reading two a week minimum but it never seems to work out that way. There's things to get done around the house or dare I say television to watch. Ha! I'm still ahead on my Goodread's goal so I must be doing something right when it comes to hitting my goal of 75 books for the year. I have a bunch of reviews that I need to write up since I haven't been posting but I will catch up with them when I can. 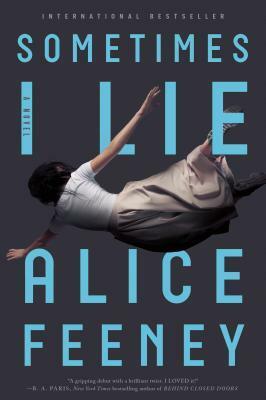 Sometimes I Lie by Alice Feeney was a highly anticipated read for me that I ended up enjoying a lot. It left me thinking about it the day after and I haven't yet settled on my full feelings - it was good to very good but I don't think that I would classify it as a five star read like so many others have. Was that a case of too high expectations? I'm honestly not sure so I'm going to think about it a little bit more before I write up my thoughts. I received a surprise copy of this book thanks to the publisher and it was perfect timing with the reading mood that I was in! 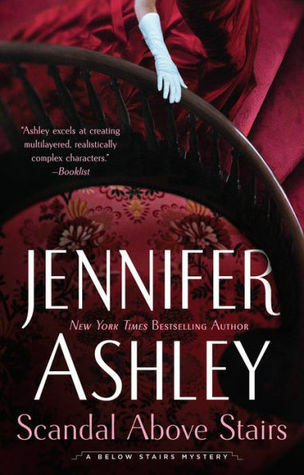 I can't tell you the last time that I read a historical romance so I jumped at the chance to read this one. I'm just slightly over halfway through and enjoying it immensely. It's the perfect change of pace from all of the mysteries and thrillers I've been reading lately! Lots of great reads there that I just need to find the time to share my thoughts on! I haven't decided on my next read although I do have a bunch of great sounding books checked out from the library to choose from. We had a softball meeting earlier this morning and then baseball practice so I don't have much planned for this afternoon. Curling up with my book sounds like the perfect plan but I also need to make sure homework is done and the kids are ready for the upcoming school week. Don't worry though - I will definitely be finding some quiet time to read as well! Happy Sunday and Happy Reading!